Them old-time chuck wagon cooks were tenacious people, they found a way to prepare meals every day under very limited conditions. When I moved down south, I heard about a thing called Chicken Fried Steak and assumed it literally meant what it said, and of course it did. You could take a nice piece of Roundsteak, pound it thoroughly with your meat mallet and make a mean dish of it, reminiscent of the chuck wagon guys. It's a separate food group in Texas, like barbecue, for crying out loud. Nowadays in super market meat display cases, “cube steaks” can be found, the machine-perforated steaks that cook quickly and taste real good. 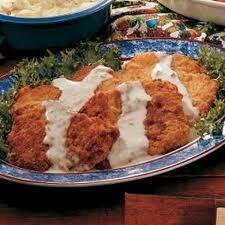 These are good for Chicken Fried Steak, but look at the meat as close as you can, so it is not tough with sinew. It’s easy to put a big pot of rice on the boil when you make this, or boiled potatoes. Steamed green beans go good too. The gravy enhances the vegetables. Dip the steaks into milk and then flour (work in all the flour) salt and pepper them and put them in hot oil (375F) until golden brown. You can use a deep fat fryer or a one-inch depth of oil in a saucepan. Peanut oil is good. When done, remove to drain rack or paper towels. Pour off all but a tablespoon of oil. Add a tablespoon of flour and stir into the oil to make a roux. Bring a pint of milk to the boil meanwhile, and then add to the roux, whisking or stirring rapidly to make the gravy. The gravy is good on the steaks and the vegetable accompaniment. Old time Chuck Wagon cooks would marinate the steaks in a mixture of water salt and vinegar, but today’s steaks don’t need that, unless the grade is very tough meat. Try it you’ll like it. As big as Texas is, Chicken Fried Steak is never far away. For good reason. chanced on you in foodieann. have a preference for bloggers who're writers..now me in a flux: shifting station; going hometown for interim stay...lemme be in peace. will be back for more here. i notice your wife is a children's writer...i have two young kids.